Let's get this out of the way. There's a saying in the fitness community that "six packs are made in the kitchen, not the gym." That's an oversimplification, but it's mostly true. The fact is that we all have abdominal muscles, it's just that most of us can't see them under that lil' bit of extra padding. If you really want to expose those deep cuts that separate the muscles, you've got to burn off the fat. You might think that 1,000 crunches a day is the key to burning that fat off. It's not. While they won't hurt, 1,000 crunches isn't generally the best cardio. In order to burn fat you need to create a caloric deficit. In other words, you need to use more calories than you consume so that your body is forced to burn the excess calories you have stored as fat. You know. Eat right and exercise. While diet is arguably the most important factor, there is one other thing you can do (that's right, just one): you can make your abs bigger. Looks aside, there are actually a lot of functional benefits to bulking up your abdominals. As with any other muscle group, size equals power. Having a more powerful core will help you align your posture, it will reduce fatigue in repetitious physical tasks, and it can go a long way in reducing injuries, especially to your back. Plus, you'll be able to lift more, which may come in handy in emergencies, or life in general. Larger, more powerful muscles also tend to atrophy slower. In other words, you retain the benefits longer, generally speaking. And muscles burn calories, so the more muscle you have the more efficient you are at burning fat and/or keeping it off. If you're worried about more abs making you look too bulky, don't. The fact is, it's not easy to grow muscle, and it's really, really hard to over-grow it. Those scary-looking bodybuilders don't get like that by accident, and neither will you. 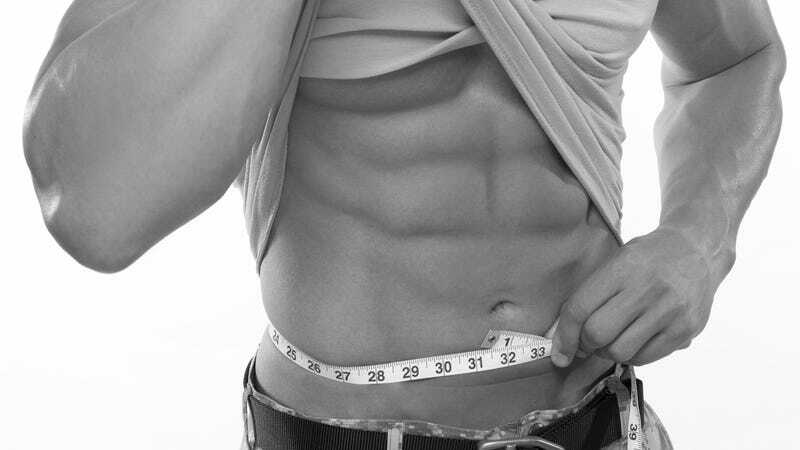 Okay, so we want to add some lean muscle mass to our abs. But how? If you wanted to get bigger biceps, you wouldn't lift a one pound weight 500 times, would you? No, it would take forever and it might make the muscle stronger and firmer, but it wouldn't make it bigger (editor's note: remember you can't see firmness through the padding, only size). Abs are just like any other muscle: if you want to increase size and power, add weight. Somehow, it had never occurred to me to treat my abs like my other muscles. People will tell you that you can work your abs every day. But just because you can, doesn't mean you should. If you're trying to grow muscle, you need to give the little microscopic tears you cause in your muscle fibers with every work out time to heal, rebuild, and grow. Starting slowly, so you know your limits and don't injure yourself, try moving over to a routine where instead of, say, three sets of one hundred crunches, you're adding weight to a sit-up, leg lift, or other abdominal exercise to the point where you can only do a set of eight to twelve reps. Then do three sets of those. This applies to your lower abs and your obliques (your side muscles, used for twisting) as well. I recommend doing an exercise that focuses on your upper and middle abs, then an exercise that focuses on your obliques, then an exercise that focuses on your lower abs (in whatever order you choose). That will basically cover your whole six-pack zone. Bonus tip: with most ab exercises, adding a bit of a twist will help engage your obliques and transverse abdominal muscles, but again, be careful when you're starting out and adding weight. This is not to say that high-rep exercises have no value. Quite the opposite, in fact. All of this is the subject of much debate in the fitness community, but it's generally agreed that high-rep/low-weight exercises are great for building endurance and stamina (jogging is a pretty good example). Those exercises will make your abs stronger and harder, and if you do a freaking ton of them (to the point of failure, just about) they can increase muscle size as well. In other words, it has tangible benefits, but it's not the most efficient way to reveal the washboard. Ultimately, it's generally best to build a routine that favors higher-weight/fewer reps, working bit of low-weight/high-reps in there every now and then (though you may find your own special formula). That will get your six pack poking through and will increase strength and longevity. In other words, the best of both worlds. Oh, and diet. Always diet. Sigh.